“Mummy, what does shy mean?” asks my (newly) four year old son. It dawns on me, in that moment, that he hears so many people call him shy. Shyness is stigmatised in society. Sensitive boys, in particular, are misunderstood and even bullied. Shyness is a personality trait, not a fault. My son is very self-aware, compassionate, observant, inquisitive and kind. He’s slow to warm up in social situations, even if it’s something he is really excited to be a part of. Given that I’m introverted, I realise the significance of nurturing the person Cameron is. I want him to feel empowered by his sensitivity. I want him to be himself – not some molded version of himself that fits societal norms. I don’t want him to feel like he has to change who he is to gain the ‘approval’ of others. He is respected. I respect his need for time and space. Being sensitive/shy/introverted are not negative things. I’ll always be there – encouraging and guiding him. Embrace shyness and sensitivity for the gift it is. Don’t simply accept it. Don’t label my son – there is no need to call him shy or clingy. He may be feeling shy or taking time to warm up to the situation, but there is no need to shame him. With sensitivity comes insight, creativity and empathy. Update: as a 7 year old, he’s still that same incredible person! When I feel challenged as a parent with a sensitive son, I remind myself that I’m learning too. Parenting a sensitive child is a delicate balance between helping your child flourish within their personal boundaries, and becoming over-protective. Prepare your child for events or changes that you think could overwhelm them. Discuss what will be involved and how they can feel more comfortable. Discuss both your own, and their emotions; as well as how to best deal with and react to strong emotions. Validate your child’s concern/s. Being empathetic themselves, they may often need to know that they are understood. thank you for such a nice post. My very sensitive child is such a blessing and I hate having to feel like I have to “apologize” for her with extended family. I wish they all understood instead of feeling put off. What a great post. Very important, thanks for sharing! one” because I did not feel reserved around him! Cameron’s a lucky boy to have a mom so understanding! I’m the shy one in our family but I know it must be even harder for boys because of old-fashioned stigma. I think as long as you look at being an introvert as a positive, or even a neutral, attribute, then hopefully he will too! I feel exactly the same… My son is also quite shy and I understand him quite well because I’m an introvert person myself. I grew up thinking that I needed to change, to become more outgoing in order to be accepted, but as an adult I have realised that being an introvert has actually been a good thing for me in many situations, so now I feel confident. I just want my son to feel confident through his childhood and adolescence too, instead of waiting to be an adult to gain that confidence. Not long ago I read the book “Quiet” by Susan Cain, about the power of introverts, and I totally recommend it! I think this is such a lovely post. My son is disabled and it’s so important for me to focus on all that he IS. Love it. I used to worry people would consider me a helicopter parent if they only saw me in social settings where Imogen had asked me to stay close till she is ready, then I worry about my neighbours and people at the park thinking I give my kids too much space and freedom haha. I never let it stop me giving my kids what they need when they need it and I’ve stopped worrying about what other people think when they look through the keyhole into our life, people who truly are our friends will understand and how I’m making my child feel is more important, people judge regardless. I’m introverted myself so understand I can’t change her by forcing her into situations she finds overwhelming and uncomfortable, I’ll always be her safe place to build confidence and security and branch out from in her own time. What a lovely reminder that we are all different and that being different is a good thing. Great post! It is so important for other people to understand how we feel about our sensitive, introverted kids. 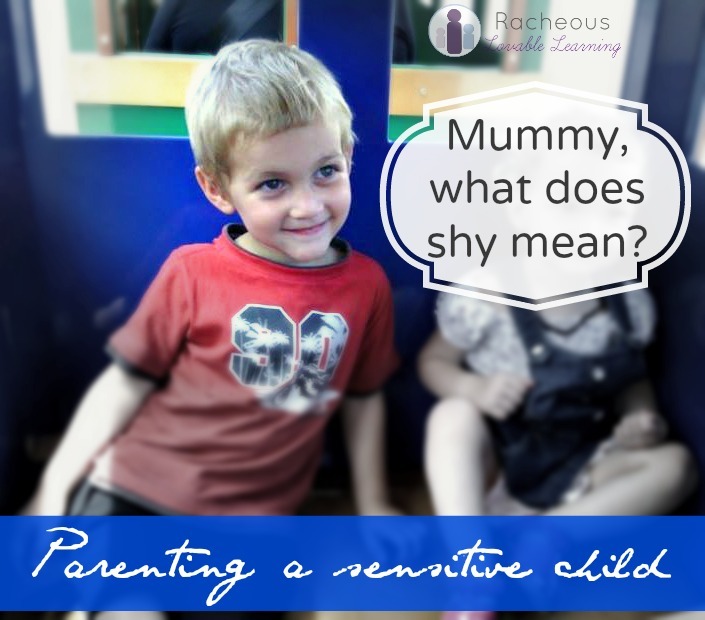 I cringe whenever someone calls my son shy, even my husband has labeled him shy to others when his behavior isn’t exactly social. But I don’t know what to say as I am also introvert. I will be sharing this article. Thanks! Thank you so much Samantha. I think sometimes we speak before thinking and are quick to make ‘excuses’ for things that really don’t need to be explained. I’m guilty of this too. Thank you for sharing and for commenting! It’s definitely a stigma that is glossed over and can really harm a persons self-esteem. Thank you for reading, agreeing (:)) and commenting! I have a sometimes shy, very sensitive son, and I love the quality in him! I think it’s important that he embraces who he is, but in saying that, I also aim to teach him, that no matter how he is feeling, he can respond hello to people who say hello to him. Just a simple hello is polite and possible. A wonderful reminder to think before you speak! Beautifully written x shared and pinned. I LOVE this and the How to parent a sensitive child post. Seriously…..could have written them myself. My mom likes to call my son “insecure” and inadvertently blames it on my parenting…..but I think it’s just who he is, and he is perfectly perfect.